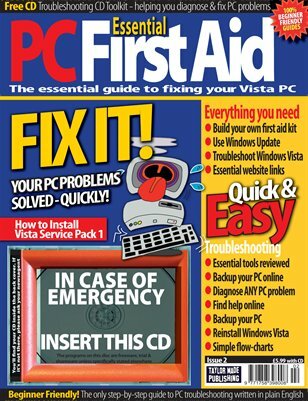 Whether you've picked up this issue of Essential PC First Aid as a precautionary measure; or to answer some problem you are currently having with your computer; may we take this opportunity to welcome you. If we have what you're looking for, superb - if we don't, please let us know. This issue we're taking a detailed look at Windows Vista's Service Pack 1. Following its release to download, there were reports of a number of issues as a result. Microsoft now appear to have evolved beyond these initial faults; and we'd say now is as good a time as any to progress with the download. We've got elsewhere an indepth guide to Windows Vista troubleshooting, a roundup of essential spyware software, a healthy dose of questions and answers and considerably more besides.We hope you enjoy the issue - if you have any comments please feel free to email us.